A very "strange" set of swizel sticks! Great for Halloween cocktails! Ivory colored molded plastic. I do not know if the clear rhinestones were the ones replaced or the purple ones are the replacements. They may have been made originaly with different colored rhinestone eyes, as I have never seen a set like this before. The stirring end of the sticks are made in the shape of a bone such as a leg bone. They measure aprox. 6 3/4"X3/4".There are a total of 9, even though I only show 4 in the pic. All have clear rhinestones except the one stated. The shipping fees quoted are for priority/No insurance in USA. 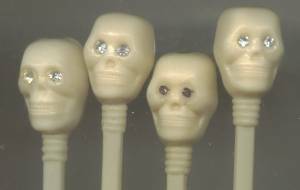 Items Similar To "Bar Ware/Holiday/9 Ivory Plastic Skull Top Swizel Sticks"